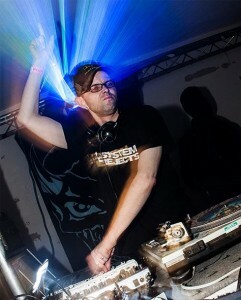 OB1 (Olly Berry) is a techno producer, performer and DJ from Bristol, UK. He has been a regular fixture on the Bristol free party and underground club scene since 1996, entertaining the crowds with his own special blend of banging, warehouse-style techno and acid. OB1 has been playing live techno since 1998, when he played his first live sets at Bristol’s Freakency club night. He went on to form the Irritant live p.a. with Dr. Chill (MJ12) in 1999. Together they played many club nights, free parties and warehouse raves all over the UK and in Europe. He has continued to take his solo live act out to underground clubs, parties and festivals in the UK and Europe, playing techno, acid and hardtechno. OB1 has focused more on studio production in the last few years in addition to playing live acid techno and has enjoyed releases on Isotope Recordings, Sketcha Traxx, Corrosive Records, Coaxial, Braingravy Records, CDJ303, Stay Up Forever Projects, Acid Test, Chase Yer Tail, UK Ruff, AK Recordings and his own label System Rejects. In 2013, OB1 founded the System Rejects vinyl label along with fellow producers Tassid, Austin Corrosive and MK303. The label was born as a vinyl only outfit, releasing extremely limited edition records featuring the founders’ own tracks (with some special guests). Later in 2013, the imprint launched Digital Rejects, a digital sister label. In the pipeline are many more releases on a variety of labels, lots of exciting studio collaborations and potentially a brand new live collaboration. And of course parties! See you down the front! This entry was posted in DJ Focus and tagged acid, DJ, FOCUS, OB1, techno. Bookmark the permalink.